Many people assume the steering and suspension on a vehicle can only affect the smoothness of the ride, however, a bad steering element or damaged suspension effects more than just the ride. When you’re driving around with worn out steering and suspension elements, it not only puts you at a greater risk for an accident, it also can have a large impact on the efficiency of your vehicle’s gas mileage to tire wear. The steering and suspension play a major role on how quickly you need to replace or repair the components that keep your vehicle on the road. At Metro Transmission and Automotive, we are fully aware of the impact a worn element can have on the overall performance of your vehicle, which is why we offer full steering and suspension service to our customers. In order to eliminate the cause of your vehicle’s steering problems, a proper and accurate diagnostics is necessary. With state-of-the-art technology and experience, we can pinpoint the failing aspects of the steering system. We will explain the results of our diagnostics so you are fully aware of your options and how to proceed with the needed suspension service repairs. 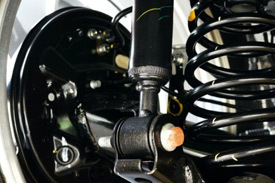 The purpose of your vehicle’s suspension is to allow your ride inside the vehicle to remain smooth and stable. As the suspension elements wear down and the motions become less controlled it creates play in the system which leads to poor handling and uneven tire wear. Our ASE certified mechanics are able to perform repairs on all of the elements of your vehicle’s suspension.